Both Men's and Women's World Rugby Rankings are calculated using a 'Points Exchange' system, in which sides take points off each other based on the match result. Whatever one side gains, the other loses. The exchanges are based on the match result, the relative strength of each team, and the margin of victory, and there is an allowance for home advantage. Points exchanges are doubled during the World Cup Finals to recognise the unique importance of this event, but all other full international matches are treated the same, to be as fair as possible to countries playing a different mix of friendly and competitive matches across the world. Any match that is not a full international between two member countries does not count at all. All member countries have a rating, typically between 0 and 100. The top side in the world will normally have a rating above 90. An example of how a points exchange is calculated is shown further down this page. The first official women’s full international match was played in 1987 and since then the number of women’s matches is considerably fewer than the number of men’s matches. There are a number of women’s teams who do not play regular matches. As a result of the relatively small number of matches compared to the men’s and the discrepancies in the number of matches played by different Unions the effect that one result will have on the rankings could unfairly skew the result. To combat this effect, it has been decided to start all teams out on 80 ranking points (an arbitrarily chosen figure which does not have any bearing on the subsequent results of the rankings) in 1987, then for each year between 1987 and the year that an individual Union played their first women’s full international match 2 points are deducted from their total. This deduction occurs up until 2007, so if a team plays their first ever full international after 2007 then they will begin with 40 ranking points. Q. Can you tell in advance of matches what effect results will have on the rankings? Yes we can, and this means that those involved with matches can know what is at stake, going into the match. For each match, there are only five possible outcomes that can affect points exchanges: either side winning by more than 15 points, either side winning by up to 15 points, or a draw. In each case, we can advise how many rating points each side will gain or lose. This type of preview information may be posted on the site. Q. Does the system produce accurate and reliable rankings? Several years' research went into developing the system, using an extensive database of international matches going back to 1871. All the weightings and values in the system were derived from detailed analysis of the results. The system's reliability is assessed in a number of objective ways, including measuring its 'Predictive Accuracy'. If, over a period of time, the system tends to be good at predicting which side will win each match, then we can be confident that it is presenting an accurate and reliable picture of current strength, and responding appropriately to changes in form. Q. How do you allow for home advantage? When calculating points exchanges, the home side is treated as though they are three rating points better than their current rating. This has the effect of 'handicapping' the home side as they will tend to pick up fewer points for winning and give away more points for losing. In this way, the advantage of playing at home is cancelled out. Q. How important is 'margin of victory' under the system? The research suggested that match results are more important than margins of victory in producing accurate rankings. For instance, whether a side wins by 60 points or 100 points against much lower-rated opposition is not a good indicator of future performance. However, the analysis also indicated that it is significant whether sides win relatively comfortably - with 'something to spare' - so a weighting is applied where a side wins a match by more than 15 points. Q. Do sides earn credit for losing narrowly to higher rated opponents? No they don't. In this system, you can't win points for losing, or lose points for winning. While it may be attractive to award points for heroic defeats, it is less appealing to deduct points from a team that has won. If the close match was an indication of a genuine shift in relative strength, this would be reflected in other results. Q. Are all matches treated as equally important? We have added a weighting for matches in the World Cup Finals, to recognise the unique importance and prestige of this event. All other full international matches between member unions, where players earn caps for playing for their country, currently count the same. Q. Where do new countries start? 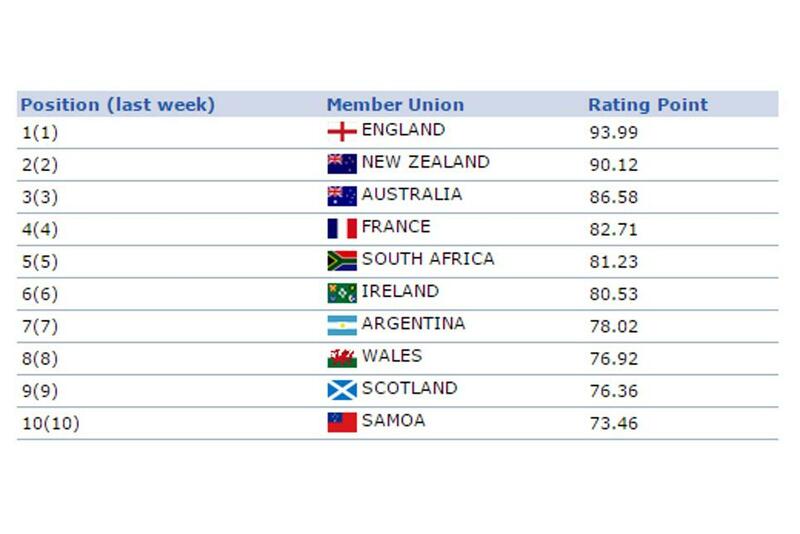 As of 1 December 2012, as soon as a country becomes a World Rugby Full Member Union, they are added to World Rugby World Rankings with a rating of 30. The rankings are responsive to results and it is possible to get from the bottom to the top (and vice-versa) in less than 20 matches. Countries will normally have a rating between 0 and 100. Q. Will some countries tend to be higher rated at certain times of the year, such as following the Six Nations Championship? No. As all matches are worth a total of 0 points (as whatever one side gains, the other loses) there is no particular advantage to playing more matches. Under the system, a country has a certain rating, which stays the same until they play again. Although matches often result in points exchanges, relatively 'predictable' results lead to very minor changes, and may result in no change to either side's rating at all. Q. How important are past achievements in calculating the rankings? The system is designed to produce an accurate picture of current strength, based on results. The importance of past successes will fade and be superseded by more recent results. Q. How does the system deal with freak results? There is a maximum that any side's rating can move, either up or down, based on one match result, to make sure that the system does not over-react. Q. What happens if a country does not play for a number of years? Their rating may be deemed to be 'dormant', in which case they will be removed from current ranking lists. However, when they are active again they will pick up their rating from where they left off. Q. What happens if countries split, or merge? When countries merge, the new country inherits the highest rating of any of the constituent countries. When countries split, the new countries will inherit a rating at a fixed level below the rating of the original country. For illustration, we'll use the Six Nations match between Wales and Scotland in Cardiff on 14 February 2004, to describe the process. The top 10 countries in World Rugby World Rankings, immediately before the match, are shown below. Wales were on a rating of 76.92 and Scotland slightly lower on 76.36. 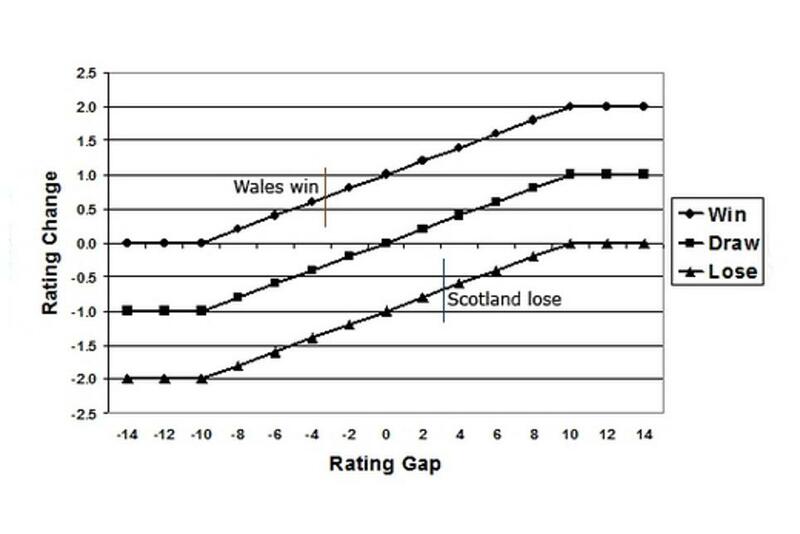 This gives Wales a rating of 76.92 +3 = 79.92, against Scotland's rating of 76.36. Allowing for home advantage it is 79.92 - 76.36 = 3.56 (in favour of Wales). 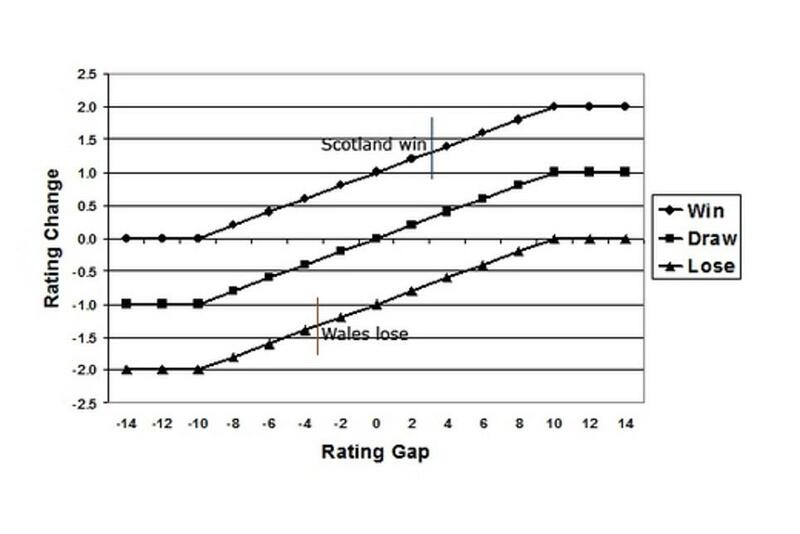 And finally if Scotland won their Core Rating Change would be up, and Wales's down, by 1.36. 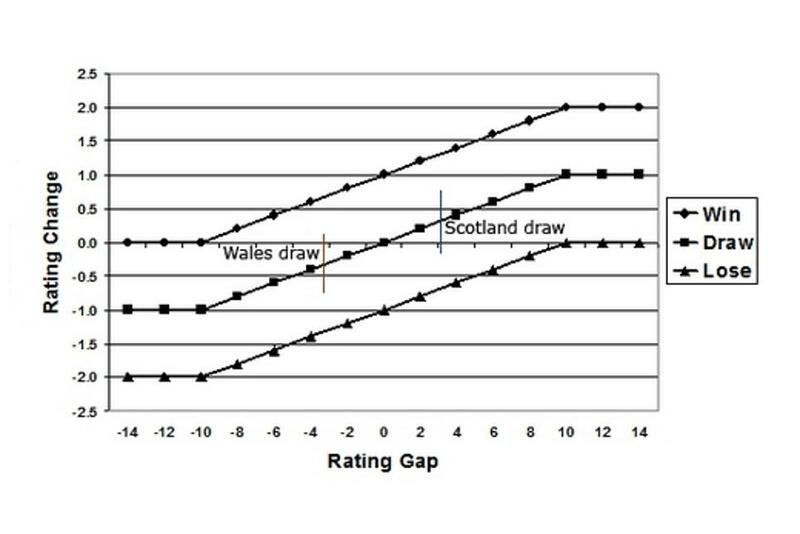 So Wales, as the higher rated side (especially allowing for home advantage) would pick up fewer points than Scotland if they won the match, and would give away more points if they lost. If one side has won by more than 15 points, we multiply the Core Rating Change by 1.5. So if Wales won 30-10 the points exchange would be 0.64 x 1.5 = 0.96. If the match was part of the World Cup Finals, we would then double the Rating Change. Wales won the match 23-10, so the sides exchanged 0.64 rating points, with Wales going up to 77.57 and Scotland going down to 75.72.